Modern life often feels harried, with no time or place to stop and rest. But that pace takes a toll on us, body and soul. The Green Sheep aims to take a stand—an unanxious, patient, buoyant kind of stand—against the insanity. I work to make each blanket a thoughtfully designed oasis of softness, warmth and protection. 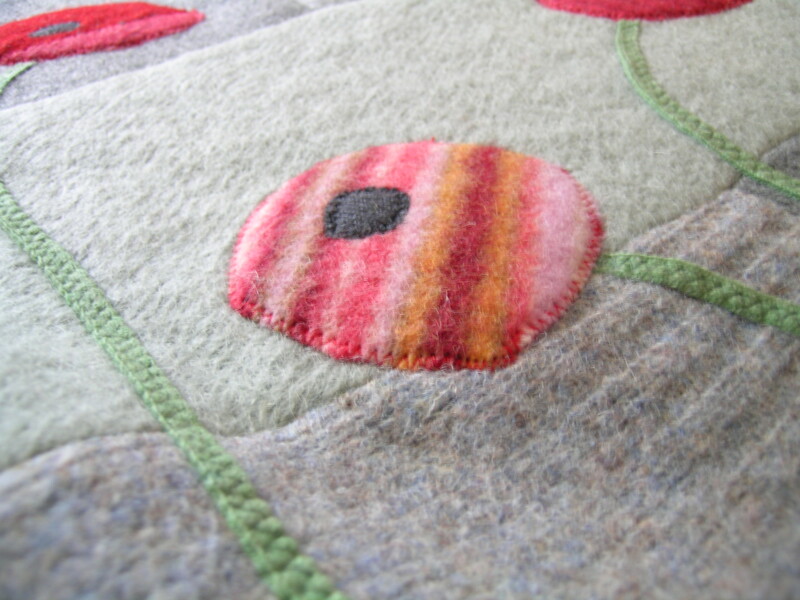 The Green Sheep began in 2009 after I got my first taste of working with felted wool. I was captivated. (You can find the story of the blanket that started it all here.) The wool’s rich color, deep texture, drape and softness — they were all a big surprise to me. And I’m telling you, from the very beginning I could hear those sweaters calling to me with impeccable color combinations. Why this never happened in my own wardrobe I’ll never know. The items on this site are made with repurposed wool sweaters which I felt myself. Have you ever accidentally shrunk a wool sweater? and learned there is no undoing that? That’s essentially what felting is. Hot soapy water + agitation –> irreversible interlocking of wool fibers. Although outcomes vary due to differences in the wools themselves and the way they’ve been processed prior to becoming sweaters, most 100% wools after being felted will not fray when cut. I do leave the seam edges raw on the backs of my blankets. It’s akin to having seams on the inside of clothing. The inspiration for the blankets comes from many sources: fondness for a particular time or place, memories of a loved one (the Legacy Blankets), a sensation, a photograph, even a conversation. So each blanket has a story, whether from my own life or someone else’s. But each viewer brings a story to the mix too, as they discover that a blanket reminds them of their own place or feeling or fondness for something. This blog is full of those stories. Please read and explore…and drop a comment on a blanket post that somehow speaks to you!